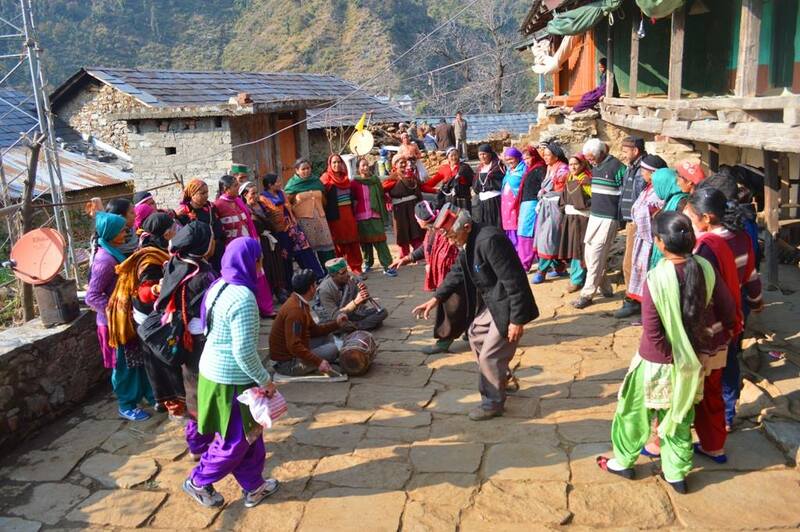 Tribal Life in Tribal villages at Bir Billing valley. Bir Billing valley is gateway to various unexplored treks to tribal villages. Treks are suitable for all age groups. One can choose treks as per his fitness level. Tribal villages trekking is one of the best experience one can doexperience at Bir Billing with Paragliding and camping. Thathi Village is a group of three tribal villages, namely Kothar Thathi, Chougan Thathi and Kryon Thathi. None of these tribal villages having road connectivity. Villagers lead a semi-nomadic life , spending one half of the year at Thathi and the rest in Bhangal Valley, where they spent most of the summer where they grow vegetables. Some of the villagers are shepherds and travel with their flocks to higher grazing fields in Dhouladhar ranges from April to October. Houses are constructed old traditional pahari way. If you stay at Camp Oak view, the village is 2-3 hour trek from the camp. Raj Rajgundha Village Located 12 km. from Billing at the banks of Uhl River at an altitude of 2500 mt. from sea level. Raj Gundha is considered as most beautiful village among all other tribal villages of valley and other parts around. Raj gundha is a picturesque tribal village of semi nomads, the villagers move down to Bir during winters, farming in Rajgundha from April to November. A part of the historical Chota Bhangal region, the villagers are known as Bhangalia. Rajgundha is a 4 – 5 hour from Billing, the alternative route requires driving 50 km. from Bir to Badagran village from where the Rajgundha is a 2 hour hike. One can trek to Thathi village from Raj gundha and then to Camp Oak view in single day through dense forest full of wildlife, including the rare Monal. Badagran is a quintessential old Himalayan village with houses made of stone and wood. This village is recently connected by road with the other lower area of Himachal Pradesh. Villagers live on livestock and the vegetables they grow. Valley is tremendously fertile to grow vegetables and pulses. The area is disconnected with other world in winters due to heavy snow fall. Bada Bhangal is considered as one of the last bastions of tribal life in Himachal, accessible for 11 months in a year. Bara Bhangal is 3 days trek away from Bir and forms a part of the trade route from Kangra to Manali. To reach Bara Bhangal village one has to cross Thamsar pass at 4750 mt. from Billing or Kalihani pass at 4600 mt. if approaching from Manali. Local villagers depend on their cattle and on the medicinal plants are collected from the higher mountains legally or illegally. The medicinal value of some plants is very high. Bara Bhangal is a small village at the bank of Ravi river has 50 – 60 houses. The people of this village are Semi-tribal, they have two houses. Five months they live in Bara Bhanagal village in summers and shift to lower houses in winter for seven months.